We use Windows Azure around here a lot, it works great with Access but it has one limitation: you can’t copy data from one database to another since they don’t support the USE statement. Click on OK and click on Next until your script is created. 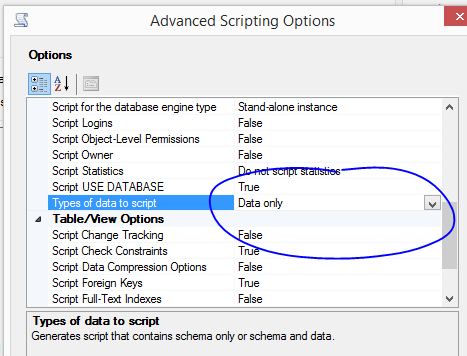 The system will create a new query window, change the USE statement at the top and copy/paste in a new query window of your destination database. Run the script there and it will insert all of your data. This works great if you are not inserting a lot of data, otherwise it may create a script that is too long to run.